In July 1914 the First World War broke out and at the same time a new epoch in history began. Until 1914 the workers of Europe had given their allegiance to the Social Democratic parties which made up the Second International. Although a few of its revolutionary members recognised that it was riddled with opportunism, none of them anticipated the great betrayal of August 1914. When news reached Lenin in Austria that the Social Democratic Parties, headed by the German Party had voted for war credits and therefore for support for their own ruling class in the imperialist war he believed the copy of Vorwarts (1) he was reading to be a forgery produced by the German military. Closer to the event, Rosa Luxemburg was paralysed with shock and is said to have contemplated suicide. do all in their power to utilise the economic and political crises caused by the war to rouse the peoples and thereby to hasten the abolition of capitalist class rule. This “tragedy” (Bukharin) was not only to reveal the counterrevolutionary nature of the Social Democratic and Labour movements of Europe but was also to make the Russian working class the vanguard of the anti-war struggle which now slowly gathered momentum throughout Europe. The Bolshevik Party which had formally come into existence in 1912 was a direct result of the rejection of the idea of a mass party of the normal social democratic type. The struggles with the Mensheviks over the exact definition of a party member was no exercise in semantics but lay at the core of the idea of a party which was above all aiming for revolution. Whilst Western European parties grew big and fat on the cosy assumption that they might one day be elected to power, the Bolsheviks operated largely illegally and thus never acquired the property which German Social Democracy and its unions amassed - a property which made them incapable of even contemplating a return to an illegal existence. 1914 proved categorically that there can be no niche for revolutionaries within capitalist society and that the future belongs not to mass electoral parties but to parties of the Bolshevik type. And, as he spelt out in Imperialism - The Highest Stage of Capitalism, this was the epoch of imperialism, “of the decay of capitalism” or “a period of the end of capitalism” (op. cit., p. 87, emphasis in the original). Let us raise the banner of civil war! Imperialism has put the fate of European civilisation at stake: this war, if there does not follow a series of successful revolutions will soon be followed by other wars ... If not today, then certainly tomorrow; if not during the present war, then after it; ... the proletarian banner of civil war will rally not only hundreds of thousands of enlightened workers but also millions of semi-proletarians ... Overwhelmed by opportunism the Second International has died. Down with opportunism, and long live the Third International! Lenin’s revolutionary defeatism was then no mere tactic of the moment but was a long-term perspective founded on the fundamental idea of Imperialism - the Highest Stage of Capitalism that capitalism had entered an entirely new epoch in its historic course, the epoch of the decadence of capitalism, the epoch of imperialist war. This aspect of his thought cannot be emphasised enough since this was the basis of his break with Social Democracy in the period 1914-21 (i.e., the period of revolutionary advance). It is also the aspect of Lenin’s ideas which is omitted or de-emphasised by so-called Leninists of the Trotskyist, Stalinist and Maoist schools who, basing themselves on the return of the Third International to Social Democracy in the 1920’s, all seek to reincarnate some form of the minimum programme of Social Democracy within the working class. In other words, they are the carriers of counter- revolutionary ideas within the working class today (2). In adopting revolutionary defeatism, bourgeois histories will concede that Lenin was, of course, a master tactician (by which they mean opportunist - the Marxist method behind his tactics being, naturally enough, either denied or not understood). This is only to reinforce their “great man theory of history”. References to Lenin’s “lonely stand” at the socialist conferences against the war held in Switzerland (at Zimmerwald in September 1915 and Kienthal in April 1915) are numerous. We are told that only 8 delegates at Zimmerwald and only 12 at Kienthal supported revolutionary defeatism (the majority instead going for a pacifist declaration which looked forward to reforming the Second International). What, of course, this image leaves out is the fact that Lenin was not the prophet in the wilderness but part of a living class movement which although active elsewhere had its firmest material roots in the anti-war struggles of the Russian working class. the largest wave of working class struggle... since Chartism. There was not one ruling class in Europe which was not mindful of the benefits imperialist war would bring in terms of social peace. On August 2nd 1914 the Russian Tsar issued a typical example in his Imperial Manifesto which demanded that “in this hour of threatening danger, domestic strife be forgotten”. And there was certainly plenty of domestic strife for him to worry about. In 1910 the number of workers participating in political strikes had fallen to 4,000, but in 1912 the Lena Goldfield strikes, in which hundreds of workers were shot dead by the police, was the signal for a new wave of struggle as the following table of workers involved in political strikes shows. ... the outbreak of war in August l914 defused the insurrectionary mood... a wave of patriotic support for the war combined with repression by the authorities led to the virtual disappearance of strikes until July 1915. In that month there were 29 strikes (as opposed to the average of 5 in the previous year), and over 200 more in the last quarter of the year. In other words, the war had only bought Russian capitalism breathing space and, as Lenin had foreseen, the economic crisis produced by the war would only bring about an even more intense struggle later. How did the Bolsheviks fare in this situation? It is often argued that the Bolshevik Party inside Russia did not mirror Lenin’s own intransigence on the war issue. The usual evidence that is cited for this is the feeble performance of the Bolshevik Duma (or Parliament) deputies (who left the Duma instead of voting on the war credits motion) at their trial in February 1915, and Kamenev’s repudiation of Lenin’s s position on the formal grounds that it had not been formally adopted by the Central Committee. Down with the War! War on war! must roll powerfully across... the width of Russia. Workers must remember that they do not have enemies over the frontier; everywhere the working class is oppressed by the rich and the power of the property owners... Long live world wide labour solidarity!! Shlyapnikov, who was the chief Bolshevik organiser in Petersburg for most of the war, complained that at this time many intellectuals deserted the struggles of the working class (often for jobs in the war effort) and that this made the work of producing propaganda harder. In addition the Okhrana (the Tsarist secret police) continuously tried to decapitate the Bolshevik Party. Not only were the Bolshevik Duma deputies arrested in November 1914, but the Petersburg Committee was arrested in July 1914 and in May 1916. On top of this was the arrest of hundreds of the most active workers and a great shortage of funds. However, the Party organisation was never smashed thanks to the increased capacity of the local committees which not only learned to do without the intellectuals but were in fact the real backbone of Bolshevism. Thus the Bolshevik Party was able to operate for most of the war without a Russian Bureau (the Central Committee’s representatives inside Russia) without being paralysed. This was achieved because the Petersburg Committee was able to take on its role of co-ordination and leadership. And when this was arrested the task passed to the Committee of the Vyborg District of Petersburg. ... the central point of the ideological work of the illegal cells of our party, scattered around all the industrial centres of Russia was the attitude to the war, the struggle against chauvinism and “patriotic” exploitation... Evidence of the active work of the workers’ organisations in the war is provided by the exile of thousands of organised workers, arrests and the posting of strikers to front-line positions. Shlyapnikov’s memoir is full of the texts of anti-war propaganda issued by the Bolsheviks on every conceivable occasion, amounting on average to one leaflet for every week of the war. In every strike they always tried to get the slogan “Down with the war” included amongst the economic demands as well as the passing of resolutions against the war in every factory. 5. the only effective means of struggle against the crisis is a struggle against the causes producing it, i.e. a struggle against the war and the ruling classes which plotted it; in taking all this into account, we call upon the Russian working class and all democrats to take the road of a revolu tionary struggle against the tsarist monarchy and the ruling classes behind the slogan of “Down with the war!”. As the only party with all-Russian organisation the Bolsheviks were already better prepared for the events of February but they were above all politically armed and active inside the working class. These were to be invaluable assets in the February Revolution and its aftermath. witnessed the largest number of economic strikes of any month of the war. At this point workers for the first time achieved significant wage increases as “a strong anti-war mood developed” (loc. cit.). But, despite a massive wave of solidarity in these struggles they were physically crushed by the end of March. This only ensured even more militancy when the strike wave renewed itself in the autumn. By now the food shortages and escalating food prices had driven the Petersburg workers to the limit. Now even the rumour of a Bolshevik leaflet was enough to spark off a strike. From September 1916 onward every strike was much more political, calling for the fall of Tsarism and taking up the Bolshevik slogan of “Down with the War!”. ... certain comrades take the position that we are living in the era of social revolution. This was not the position of the Bolshevik leaders in Petersburg (though Lenin was telling Swiss socialists something similar at about that time). For example, Shlyapnikov twice refused to distribute arms (though he later justified this on the grounds that a few handguns were insignificant when the real task was to win over the workers in uniform) to workers who requested them, and some Bolsheviks even spoke of trying to end this “premature” movement. It was only on February 26th when over 200,000 workers had been out for 2 days that the Bolsheviks issued a leaflet calling for a general strike. 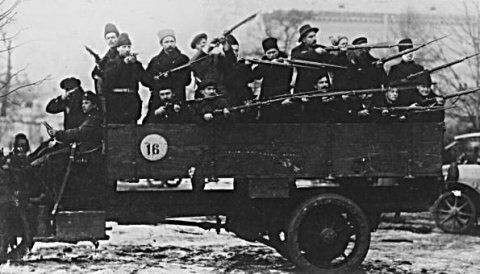 the Bolsheviks were the main organisers of the strikes and parades. He also notes they were the first to raise the question of reviving the Soviet of 1905 (they had first proposed this in September 1915 in response to the elections for the Tsarist War Industries Committees). The fact that the Soviet was eventually brought into existence by Mensheviks led by Gvozdev, the pro-war leader of the workers’ group of the War Industries Committee is evidence enough that the real aim of reviving the Soviet was to recuperate the workers’ struggle for the imperialist aims of the Russian bourgeoisie. This can also be seen in the representational arrangements which required one delegate for every 1000 factory workers, and one delegate for each regiment. Many smaller factories in which the Mensheviks predominated sent one delegate whatever the size of their workforce. Many regiments were represented by their officers and, as the soldier element was two thirds of the Soviet, it can be seen that the revolutionary element (which was in any case still engaged in street-fighting with the police on February 28th when the elections were held) was massively under-represented. This meant that the Bolsheviks were under-represented in the early days of the Petersburg Soviet. But as local soviets began to spring up in the working class districts, the Bolsheviks often gained a majority because of their previous role in the struggles against the war. It was from this base that the Bolsheviks were able to build up their support and eventually to turn the Petersburg Soviet into a body capable of a revolutionary transformation by September 1917. But their victory was achieved because they alone refused to swing behind the national war effort once the republic had been proclaimed. Turning the imperialist war into a civil war was no mere tactical slogan but lay at the very root of the new political programme of Bolshevism. This programme was only finally to take shape in April 1917 when Lenin won the fight to rid the Party of its last vestiges of Social Democracy. It is to this issue that we now turn. (1) Main paper of the Social Democratic Party of Germany. (2) For a more developed view of this, see the series of articles published in Revolutionary Perspectives 18 to 22, £2 each from the group address.